I get it, you’re passionate about your beliefs—that’s highly admirable. Much of what you hold to be true and the framework of your worldview are founded upon your understandings of the Scriptures. For you, the Bible is the perfect Word of God without any mixture of error, and your interpretation of it is believed to be grounded in ultimate truth, faithful scholarship, and divine discernment. In response to a world deemed to be in serious moral and spiritual decline, you see the Bible serving as an anchor for Godliness and the transformation of our planet. In your mind and heart you genuinely conclude, if more people believed like you and subscribed to your biblical understandings, it would be an instant upgrade to their life and a sure improvement to the world at large. Therefore, when you the quote the Scriptures, your desires are most assuredly noble and good-hearted. No one can deny your commitment, resolve, and tenacity towards your faith, the Bible, and a desire to make a difference. Yet, perhaps what you don’t realize is how you come across in your use of the Scriptures and some of the messages you’re sending in doing so—intended or not. When you quote the Bible at me, it feels like you care more about winning an argument than winning my heart. In fact, sometimes it seems like you’re inspired most by the prospect of somehow putting me in my place—pacing for the opportunity to engage in debate. With every verse you position to convict, condemn, and admonish, apparently you understand the Bible to be “useful in teaching and correcting” the way a tightly wound parent might deem a paddle to be useful in painfully punishing their child—any love you may intend to communicate is severely lost in translation. In fact, as much as I may desire to conclude otherwise, with every proof text and citing of Scriptural support, it feels like the Bible has become for you, less of a mirror in which to examine yourself, and more of a missile to launch at others. Maybe, just maybe, if you’d stop quoting the Bible at me, I’d actually start believing you might truly want to know me, understand me, and even love me. When you quote the Bible at me, it makes me wonder if you really know what you believe. I mean no disrespect, but at times, the way the Scriptures roll off your tongue so automatically and instantly, it feels a bit pre-packaged and cut and pasted—like you haven’t taken the journey of authentic believing. The memorization of verses takes only the efforts of our brain and can be a deceptive spiritual veil to an empty life. Meditation requires the soul searching of the heart and personally encountering Jesus. My sense is that people who truly know Him, genuinely wrestle with their faith, and are treading deep into the Bible, spend far less time in need of quoting it to others and using it to justify their every belief. For the mind of Christ within them has taken the lead and what they believe is far less a product of simply the Bible saying so, but much more that Jesus has said so in their Spirit. Maybe, just maybe, if you’d stop quoting the Bible at me, I’d be far more inclined to consider that you’re actually speaking from that which Jesus has authentically revealed to you and what He might truly desire to say. When you quote the Bible at me, I get the sense that you believe to know all the answers. Sometimes, it’s even hard to get a word in edgewise. It feels like no matter what I say, somehow I’m always off the mark or completely wrong all together. For every thought I have, you seem to have a Bible verse cocked, loaded, and ready to counter it. All of which leaves me wondering, if you have all the answers already, why do you position yourself as desiring conversation? Perhaps, you’re hoping to change my mind, or simply enjoy hearing the sound of your own. Either way, the more you appear to have all the answers, the more I become convinced you probably don’t. Maybe, just maybe, if you’d stop quoting the Bible at me, I’d hear the sounds of your listening and learning instead of the chalkboard screeching nails of presumptuousness. When you quote the Bible at me, it smells of religion, not revelation. No, God never changes, but what He reveals of Himself and how He reveals Himself certainly does. Yet, with nearly every verse you quote it feels like you are desperately trying to protect and prosper the religious spirit and your long-held beliefs, instead of exuding a humility and openness to encounter fresh revelation. In fact, if I’m honest, it comes across at times as if you’re afraid of what God might reveal. It’s as if the Bible has become for you, less of a catalyst to encountering Jesus, and more of replacement for Him. All of which leaves me wondering, if God desired to grow you beyond your current Scriptural understandings and interpretations, would He even be able to do so? Maybe, just maybe, if you’d stop quoting the Bible at me, I’d be far more inclined to believe you possess the capacity for divine discernment and the journey needed for wisdom. When you quote the Bible at me, I feel like a project. At times, the way you use the Scriptures, it seems like your ultimate goal is my conversion, conformity, and compliance to your beliefs and biblical interpretations. If I have a change of mind or repent of my erring ways in response to your Scriptural interventions, a rousing moment of high-fives with your fellow Christians is surely just around the corner. You “caught’ me, “won” me, or “discipled” me into your fold, and now I’m yet another “catch” to be mounted on your spiritual mantel. I mean no disrespect in saying so, but it feels like the way you use the Bible is more like a cattle prod than a stable, and I, more of a project than a person. Maybe, just maybe, if you’d stop quoting the Bible at me, I’d be far more willing to open the gates and consider that you have a genuine care for me and my best interests. When you quote the Bible at me, I wonder what you’re trying to hide. Maybe it’s just me, but I have found, those who are constantly quoting the Bible with proof texts, debates, and scriptural arguments are often the ones concealing deep levels of spiritual immaturity, doubts, duplicity, and even carnality. In fact, Satan is described as knowing the Scriptures quite well all while completely missing the heart of Jesus—obviously. The more you quote the Bible at me, the more I begin to consider, maybe this is all just a big show of biblical smoke and mirrors concealing a cowardly wizard hiding behind a leather-bound name-engraved curtain. Maybe, just maybe, if you’d stop quoting the Bible at me, I’d feel a lot more comfortable in extending trust, respect, and credibility. When Jesus referenced the Bible, He did so primarily to reframe it and reinterpret it through the lens of Grace, love, and Himself. I’m no spiritual giant, but I have a hunch we would do well to follow His example. 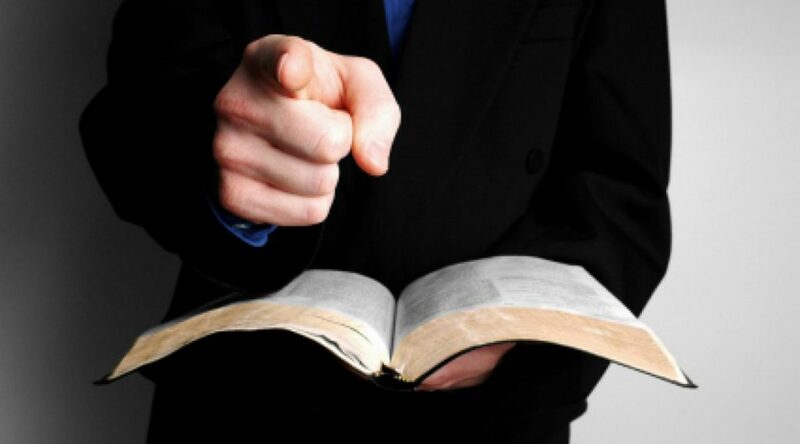 Maybe, just maybe, if you’d stop quoting the Bible at me, I would respect you all the more, have a greater desire to give serious consideration to your claims and creeds, and be far more apt to conclude that Jesus is truly working in and through you.